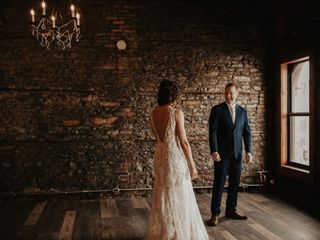 Earl & Wilson is an urban wedding venue located in historic Lowertown Saint Paul, Minneapolis. Its understated Victorian elegance welcome you and your guests as you walk through the front door of this renovated historic venue. 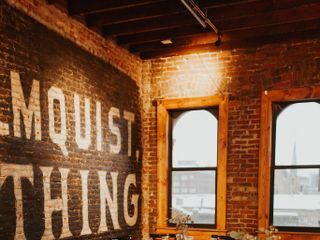 It boasts a beautiful juxtaposition of linens and crystals with exposed wood beams, original stack stone, and brick walls. 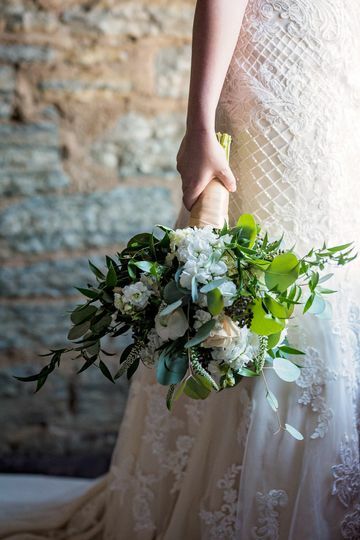 The historic charm of Earl & Wilson dates back to the late 1800s and serves as a great location to host your wedding ceremony and reception, or any other wedding-related events such as the rehearsal dinner, engagement party, and bridal shower. Elopements are also welcome. Earl & Wilson allows lots of natural light through large third-floor windows on each side of the building. The building from the 1880s sits at the corner of 7th Street and Wacouta Street in downtown and includes a graceful weathered exterior. The venue accommodates up to 500 guests. There are three distinct rooms you can use that flow from one to the other: the 1880 Room, the Lounge, and the 1900 Room. The 1880 Room includes seating for 200 with elegant chandeliers hanging from the tall ceilings. The 1900 Room is the largest space with more than 3,700 square feet and seating for 400. All three spaces boast exposed beams in the ceilings and beautiful wood flooring. There are two get-ready rooms available on-site for you and members of the wedding party. The venue has WiFi, is wheelchair accessible, and has ample parking for your guests. Earl & Main works with you to plan your unforgettable day with open and unlimited communication with their staff throughout the planning process. You have the option to bring in outside vendors, including caterers who can use the on-site kitchen to prepare the wedding day menu and dishes. There are two portable bars available. Earl & Main does include a number of event items such as tables, chairs, lounge furniture, a sound system, and microphones to use. Earl & Main is located on the third floor above Dark Horse Restaurant and Barrel Theory Brewery in downtown. Mears Park is nearby, while Saints Stadium and the famous St. Paul Farmer’s Market are within walking distance. We fell in love with Earl & Wilson as soon as we walked in. It had the exact feel we were looking for- lots of original brick, beautiful hardwoods, big windows, and pretty chandeliers. The GORGEOUS getting ready rooms were also a huge bonus! We had already looked at about 10 other venues, and Earl & Wilson quickly made it to the top of our list. After comparing pricing and features, Earl & Wilson could not be beat, and were absolutely thrilled with our choice. The getting ready rooms are not only beautiful, they’re also huge and were perfectly functional for our large wedding party. The three distinct spaces each have their own character and worked out great- our guests loved having the option to sit in the lounge when they needed to rest their dancing shoes, and the main room was large enough to comfortably seat our guest list of nearly 300. 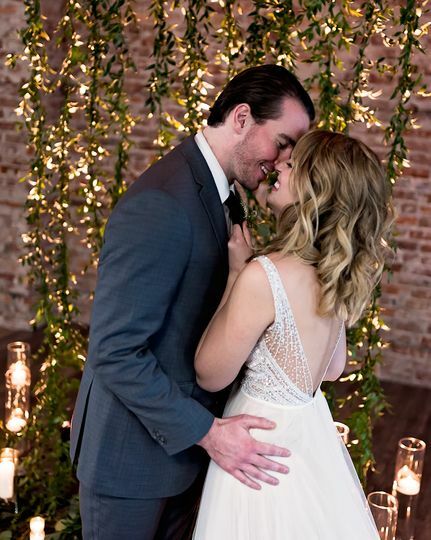 Guests raved about the beautiful setting and our pictures are stunning against the beautiful brick walls. The owners are so sweet, and were there the entire day to make sure everything went smoothly. We are so happy we found Earl & Wilson to help make our wedding day absolutely perfect!